Fukutake Hall opened on March 26th 2008. The principle source of funding for its construction is a donation by Soichiro Fukutake. The architectural design is by Tadao Ando. and position itself at the forefront of the value creation process. and provides a new space for the flourishing of creativity. thus offering new models for an information society based on cultural diversity. for learning and creativity through dialogue. On the other side of the 100m “Thinking Wall” lies a veritable crossroads between learning and creativity. One of the most striking things about the Interfaculty Initiative is that it is an interdisciplinary organization. By bringing together fields that were once separate it becomes possible to create something new. In our art projects in Naoshima and Echigo Tsumari, we have likewise experimented with the production of novelty through the conjunction of Japanese landscapes and contemporary art. It is my belief that the ultimate goal of all scholarship should be the maximization of human happiness. Much of the research being conducted nowadays seems to concern itself more with the act of research itself, rather than remaining true to its ultimate purpose. When scholars from diverse backgrounds come together, such as they do at the III, the potential for research aimed at ultimate values would seem to be enhanced. By drawing together people from throughout the university, I hope that Fukutake Hall will become a catalyst for the building of links between the university and the wider world. The Interfaculty Initiative was established with the intention of creating values for the future by combining the diverse strengths of many individuals. In the past, Japan created new things by destroying what had been there before. This historical perspective needs to be changed so that we begin creating new things while making continued use of what already exists. I have confidence that this is precisely what the Interfaculty Initiative can achieve. Born in 1945 in Okayama Prefecture. Graduated from the Faculty of Science and Engineering of Waseda University in 1969. Started work at Fukutake Publishers (now Benesse Holdings, Inc.) in 1973. Appointed managing director in 1986. Current position (Executive Advisor) since 2014. Contemporary Art Project begun in Naoshima (Kagawa Prefecture) in 1987 as a way to bring about regional redevelopment through nature and art. Opened the Chichu Art Museum in Naoshima in 2004. Numerous prizes and awards, including the Mecenat International Prize (1998), 13th Iwakiri Shotaro Prize (2000), Mecenat Grand Prize (2006), Kagawa Prefecture Award for Distinguished Services to Culture (2006), Minister of Education, Culture, Sports, Science and Technology Award for Art (2008). Even in the context of the university as a whole, this is a major construction project. Besides including a 200-seat theater, the design is also intended to commemorate the 130th anniversary of the university’s founding. The site of the building is also significant in that it forms part of the boundary between the campus and the public street outside. This has determined the overall shape of the structure which is 100 meters long while only being 15 meters wide. With this design, I sought to perpetuate the buffer-zone quality of the location and create a new public space making use of the linear shape of the site. The design of the façade is modeled on the Sanjusangendo Temple in Kyoto, which also has a distinctively long, narrow form. The height of the above-ground portion is restricted so as not to interfere with the scenery provided by the magnificent old camphor trees that line the campus boundary. A concrete wall runs the entire length of the building on the side facing inwards towards the rest of the campus. Rather than isolating Fukutake Hall from the rest of the campus, this “Thinking Wall” is intended to open up a vacant transitional zone between the existing campus and the new building, where students can congregate and engage in lively scholarly interaction. Born in 1941 in Osaka. 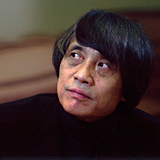 Tadao Ando Architect and Associates established in 1969. Designed numerous architectural projects, including the Church of Light, Chikatsu Asuka Museum, Awaji Yumebutai, Modern Art Museum of Fort Worth (Texas), Chichu Museum, and Omotesando Hills. Visiting professorships at Yale, Columbia, and Harvard. 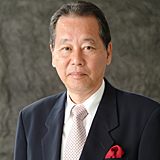 Appointed Professor at the University of Tokyo in 1997 (Professor Emeritus in 2003, and University Professor Emeritus since 2005).